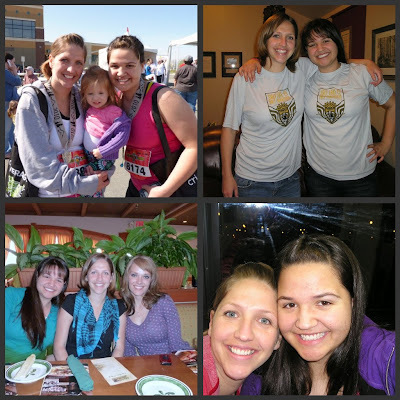 April 17th I ran the Salt Lake City Half Marathon with my sister and some friends. Everyone did great! It was so much fun to have so many people running the race. I was not as prepared as I would like to have been, but I am glad I did it. I love the adreniline rush and just being able to take off and run. I love the course, minus the big hill at mile 11, and the weather is perfect. I ran the full last year and hope to run the full next year. I love when your little sis comes to visit YW! You failed to mention that you weren't as prepared as you would've liked because you just GAVE BIRTH 5 minutes before the race started. :) You're such an inspiration. Congrats on another successful race. Maybe I'll see ya next year at the full again!? Preparation had nothing to do with you!! You are amazing! I know I tell you that all the time but you are seriously MY "American Idol!"